New York City has its fair share of weird museums, but few have the ability to appeal to the hearts and stomachs of New Yorkers quite like this one: a museum entirely dedicated to ice cream. Yes, #blessed New Yorkers, on July 29th, the Museum of Ice Cream will open its Meatpacking District doors to the masses of overheated people in desperate need of dairy. Curated by a group of designers and artists, the MoIC pop-up brings an interactive ice cream experience to 100 Gansevoort St, with an immersive chocolate room, a gargantuan collaborative ice cream sundae, and a swimmable rainbow sprinkle pool complete with a diving board. 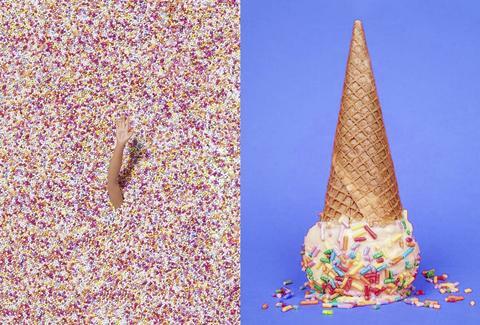 (They're not real sprinkles, but they apparently look and feel like them -- and no bathing suit is necessary). It's essentially Willy Wonka's frozen ice cream factory, where you can swing on an ice cream sandwich and seesaw on an ice cream scooper. In terms of actually consuming the museum's namesake treat, you can wander into “Tinder Land” to find your dream flavor “match” on an app before indulging in an ice cream tasting created by Dr. Irwin Adam, founder of Future Food Studio. Each week brings a unique flavor crafted by the heavy hitters of New York's ice cream scene, from OddFellows Ice Cream Co. to Black Tap. The Museum will only be around until August 31st, so don't miss your chance to swim in a pool full of sprinkles -- a bucket list item you definitely never expected to have. Tickets are available online only, and (as would be expected) they’re going quickly. See you in the chocolate room! Sarah Anderson is the senior production assistant at Thrillist, and her skin crawls when the people in her home state call sprinkles "jimmies." Follow her on Instagram @smileforsarah and Twitter @sarah_jfa.